From Anonymous of Lakewood, California on 12/12/2018 . the only coffee that doesn't irritate my stomach----and great taste!!! From Anonymous of Houston, Texas on 12/3/2018 . The aroma and smooth taste of this Kona from C&T takes me back to the Big Island. I try an buy from the winners of the annual cupping contest and this is my favorite to date. You exceeded my expectations this year. Thank you. From Janet Brown of Middleboro, Massachusetts on 11/19/2018 . The Kona coffee was a birthday gift for my husband. I just gave it to him today and he said it's the best Kona he's ever tasted. It pays to buy from the "mother ship" so to speak. New England doesn't make a good Kona coffee. I will definitely reorder when this bag runs out. From Caron Dodson of Long Beach, California on 10/13/2018 . I have been buying the Peaberry dark roast for awhile now - love it. Wanted to try something a little "milder" for when we have guests. This is the perfect fit. It's full of flavor with no bitterness. From Anonymous of Concord, California on 10/5/2018 . From Anonymous of Long Beach, California on 10/5/2018 . From Anonymous of Taos, New Mexico on 9/6/2018 . From Anonymous of Oakland, California on 8/23/2018 . From Joni Lamon of Big Rock, Illinois on 6/1/2018 . From Anonymous of fircrest, Washington on 5/19/2018 . a great way to wake up in the morning. From R. Jack Daniels of Cleveland, Tennessee on 4/19/2018 . 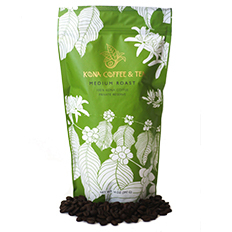 First time to order but not a first time user of Kona Coffee and Tea Company. 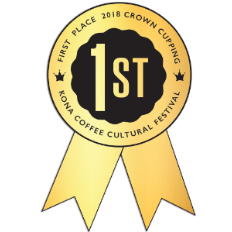 We have family that lives in Kona and have tried several different farms coffee while on the Big Island but the quality of KCT is tops. From Heather Holland of Fond du Lac, Wisconsin on 4/15/2018 . 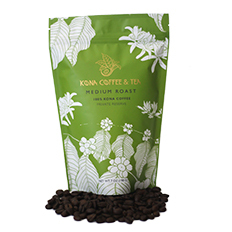 Medium roast Kona coffee makes a great cup of coffee. It's my go-to when I want a tasty, well-balanced coffee. Let's face it, life is too short to drink bad coffee. From Stan Stratton of Springfield, Oregon on 3/23/2018 . For many years, I got my Kona from Trader Joes. They stopped carrying their Kona Whole Bean coffee so I went online to find it. 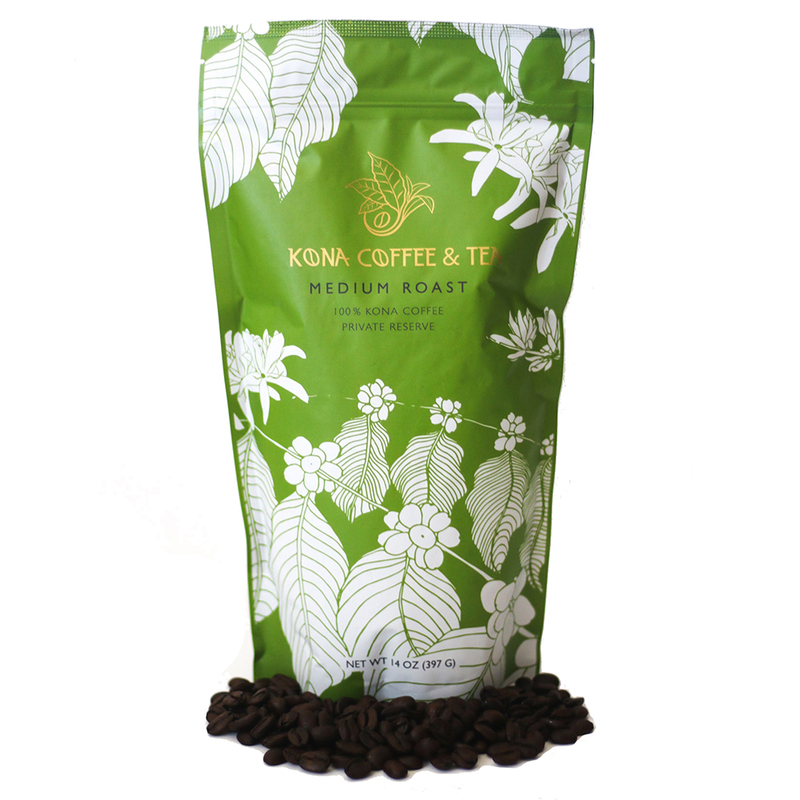 I looked at many brands until I found Kona Coffee and Tea. I ordered the medium roast 14 oz. So happy that I did. This is the best coffee I have ever had. I will be ordering again very soon! From Cline Ramey of Gillsville, Georgia on 3/12/2018 . From ALo2700 of Hawthorne, California on 3/8/2018 . Easy shipping delivered as ordered. Coffee is excellent very smoooooth flavor and taste. From Anonymous of JEFFERSONVILLE, Indiana on 2/26/2018 . This coffee is amazing and the customer service is the best! From Anonymous of Denver, Colorado on 1/15/2018 . From Anonymous of Collinsville, Oklahoma on 12/9/2017 . From John Brooke of Aurora, Colorado on 12/4/2017 . Great coffee. It is so smooth. No after taste. It's like a fine desert. Order several pounds each year after going to Kona Tea and Coffee with Mike Boyle trip. Shipping is easy and service is great. From Anonymous of Ankeny, Iowa on 11/10/2017 . Originally we visited them while visiting Kona and learned about their growing and processing of the beans. Previously I didn't drink coffee because of the acidity. They helped me find coffee with low acidity and good flavor. We've been ordering since ten. Great customer service also! From Richard Monson of Greensboro, North Carolina on 10/23/2017 . Ordered as a gift to a friend. Transaction went smoothly. Nice packaging! Arrived as scheduled! From Terri Watson of Hollywood, Florida on 10/19/2017 . 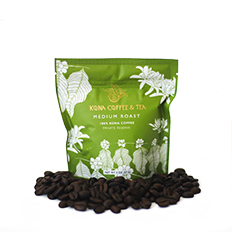 I have never had the pleasure of visiting Hawaii (not yet), but I have had the pleasure of trying Kona coffee a long time ago. It was the most delicious coffee I had ever had (I drink mine black, no sugar) and have searched for it again ever since. 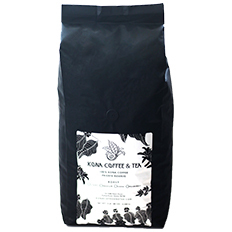 After finding only cheap "blends" in local stores, I finally found Kona Coffee and Tea online and decided to treat myself to a bag of pure 100% Kona. I was not disappointed! Kona is still the smoothest coffee I've ever had, with no bitter aftertaste at ALL. It may be a little pricier than your average coffee, but if you are a TRUE coffee lover, why drink "average" when you can have this? I plan on continuing my love affair with Kona coffee from here on out. As the saying goes, "Life is too short to drink bad coffee." Even better, maybe one day, I'll get to enjoy my favorite coffee IN Hawaii. From Cindy Zdunkewicz of Bryan, Texas on 9/25/2017 . Best coffee ever! Love.Love.Love. this product! I am a coffee "snob" so for me to give this 5 Stars is really legit. Smooth flavor. Not too strong. Very, very good! From Michael Blose of Lawton, Oklahoma on 8/21/2017 . 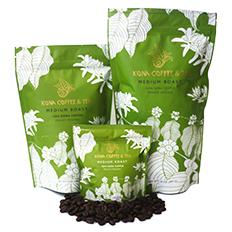 Received my 5# Kona Coffee and really have enjoyed that special taste every morning. From Anonymous of sanford, Florida on 6/27/2017 . The coffee is not too bad but I wish they would put the date on the bad when the beans were roasted. 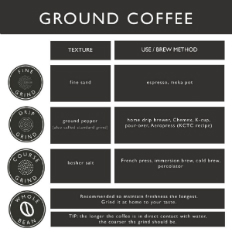 We use this in our expresso machine most days. We do a black and white with 1 shot of this coffee. Extraordinary flavor. From Anonymous of El Dorado, Arkansas on 11/2/2011 . I highly recommended enjoyed it when visiting. From Doreen Davis of Carlsbad, California on 9/9/2011 . Stellar coffee: the freshness, the quality, the perfect roast to wake up to in the morning. The best thing is the shop is right on the way to the airport so it's easy to grab a few bags to take back home with me to the mainland! Now that I'm back on the mainland, I can still get it online! From Victoria of Indain Wells, California on 11/10/2010 . This is our favorite & have used it exclusively for the past 6 years. From Anonymous of Rochester, Minnesota on 11/4/2010 . From Stephen Natelson of Taos, New Mexico on 11/3/2010 . to the big Island with my two daughters. That recall is totally worth the price! From Anonymous of Honolulu, Hawaii on 7/8/2010 .